The cannabis plant (also known as the hemp plant) has been used in just about every culture for centuries. In fact, cannabis is included in the 50 fundamental herbs within the cornucopia of Traditional Chinese Medicine. It has been cited in ancient texts as having a healing effect on over 100 ailments. In recent years in the United States, the collective mood is changing in regards to cannabis/hemp (aka “marijuana”). Personally, I prefer to use the term “hemp” or “cannabis” since those are proper names for the plant, and the truth is that the term “marijuana” (derived from the Mexican slang “marihuana”) was popularized in the early 1930s by the Federal Bureau of Narcotics (which later became the DEA) in order to make this amazing plant sound sinister and to elude the public’s existing familiarity and comfort level with the plant and the medical application of cannabis/hemp tinctures. “Marijuana” was not a commonly smoked recreational drug at the time. Currently there are 25 states where it is legal for patients to use “marijuana” for medical purposes. Pending federal legislation may open up opportunities for federally-funded medical research, including human clinical trials. This will further prove cannabis’ track-record when it comes to healing a number of disease conditions − including cancer. In the mid-1990s, renowned Israeli researcher Dr. Ralph Mechaoulam, professor of Medicinal Chemistry at Hebrew University in Jerusalem, made an exciting discovery that would forever change how we look at our biological relationship to plant medicine. Dr. Mechaoulam discovered a subtle system within the body that seemed to have a balancing effect on every other system. He called it the Endocannabinoid (EC) System and it can be found in all mammals, including humans. The EC system consists of a series of molecular receptors that are designed to receive cannabinoids. In particular this includes cannabidiol (CBD) and tetrahydrocannabinol (THC) as well as other related substances such as cannabigerol (CBG) and cannabinol (CBN). Prior research in the 1980s led Mechaoulam and others to pinpoint two main receptors for cannabinoids − cannabinoid 1 (CB1) and cannabinoid 2 (CB2). Researchers at the time also defined the natural substances called endocannabinoids, which our body produces on its own in a similar way it produces endorphins. Phytocannabinoids (namely THC, CBD, and their variants), on the other hand, come directly from the cannabis plant. Cannabinoid receptors CB1 and CB2 are designed by the body to be specific targets for THC, while our natural endocannabinoids help to synthesize it. The process of THC-cannabinoid receptor binding and what this does for the body is what researchers have been studying for over two decades. They are doing this in order to find out exactly how cannabis works in healing cancer. 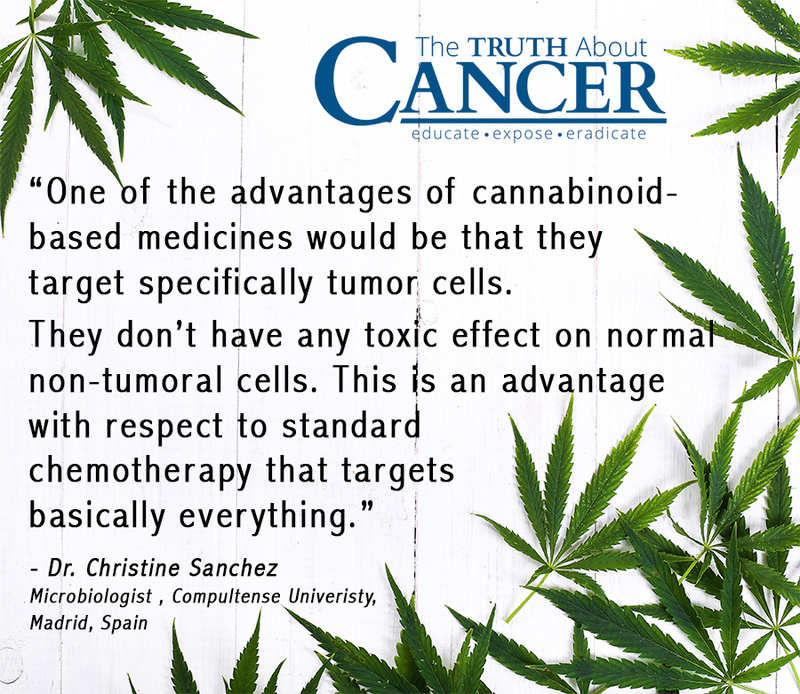 Microbiologist Dr. Christine Sanchez of Compultense Univeristy in Madrid, Spain has been studying cannabinoids and cancer since the early 2000s. She was the first to discover the antitumor effects of cannabinoids. “We now know that the endocannabinoid system regulates a lot of biological functions such as appetite, food intake, motor function, reproduction and many others and that is why the plant has such a wide therapeutic potential,” says Dr. Sanchez in a video interview for the web-based cable channel Cannabis Planet. Sanchez and other researchers have confirmed that the most potent effects against tumor growth occur when THC and CBD are combined. Cannabidiol, or CBD, which does not have a psychoactive effect, has long been known as a potent anti-cancer agent. This is because of its ability to interfere with cellular communication in tumors as well as in its ability to instigate apoptosis, or programmed cancer cell death. Some research studies, including in vitro and animal-based trials conducted by San Francisco-based researchers at the California Pacific Medical Center, have also shown that CBD may affect genes involved in aggressive metastasis. It does this by helping to shut down cellular growth receptors. Δ9-Tetrahydrocannabinol (i.e. THC), the psychoactive counterpart to CBD, has been shown to reduce tumor growth as well. It has also shown to have an effect on the rate of metastasis, including for non-small cell lung cancer − the leading cause of cancer deaths globally. A 2007 study on THC and highly-aggressive epidermal growth factor receptor-overexpressing (EGF-expressing) lung cancer conducted by Harvard Medical School found that certain EGF lung cancer cells express CB1 and CB2 cannabinoid receptors. They found that the presence of THC effected metastasis of these cells by reducing the “focal adhesion complex,” which plays a vital role in cancer migration. Studies have also been conducted on the combined effect of CBD and THC on lung, prostate, colon, pancreatic, liver, bladder, cervical, blood-based, brain, and other forms of cancer. These studies lend increasing evidence to the fact that cannabinoids are not only antioxidant phytonutrients but powerful “herbal chemo” agents. Because cannabinoid therapy is relatively new in the mainstream, a current challenge for patients regarding its use is lack of regulation. This may change, however, with the possible passing of the Compassionate Access, Research Expansion, and Respect States (CARERS) Act, which has the support of 37 members of Congress. CARERS would remove “marijuana” from the Controlled Substances Act Schedule I drug category, where it has been since 1970 − on par with heroin and cocaine. This classification is ridiculous since, by definition, Schedule I drugs have “no currently accepted medical uses” and the Department of Health and Human Services (HHS) holds a patent (U.S. Patent 6630507) on cannabis oil for medical use! Think about it. How can HHS hold a medical use patent for cannabis oil if there are no medical uses for cannabis? OK, enough of the logic lesson. Let’s just say that there are some serious logic deficiencies in these laws. If “marijuana” is rightfully removed from a Schedule I drug, this would open the door for more targeted, federally-funded research as well as increased patient access to this amazing healing plant. Do your own research. The best way to learn about the power of cannabis in healing cancer is to start digging. There are approximately 500 articles on Pubmed alone relating to cannabis and cancer. Learn about strains, qualified targeted research studies, what method of administration may be right for you, and the importance of balancing the Endocannabinoid System. Know your source. Unfortunately, because the medical cannabis industry is largely unregulated, charlatans selling bogus products definitely exist. You should not have to pay exorbitant amounts of money for any cannabis product that you buy from regulated pharmacies or online. Also, make quality a priority for you. Be sure that your product comes from an organic source and that you know that the plant has not been grown or processed using pesticides. Stick with natural cannabis products. Synthetically-produced cannabinoids such as Marinol are commercially available. However, anecdotal evidence has found that these do not work as efficiently as natural substances do. Work with a professional healthcare provider trained in cannabinoid therapy. These professionals are out there in increasing numbers, especially in states where the medical cannabis industry is well established or growing, such as California and Colorado. Reach out to a patient advocate group online if no qualified professionals are in your area. Make cannabis therapy an important part of your overall cancer-healing toolbox. A well-rounded naturally-based cancer healing protocol involves working with the body’s own healing mechanisms through a variety of means. For you, this may mean changes to your diet and lifestyle, reducing stress, getting quality sleep, moving your body, intense detoxing protocols, and using other supplements and proven natural methods in addition to the powerful healing power of cannabis.